If you’re interested in how to raise money for a good cause, ask Vicki Reich—she’ll get you started in the right direction. 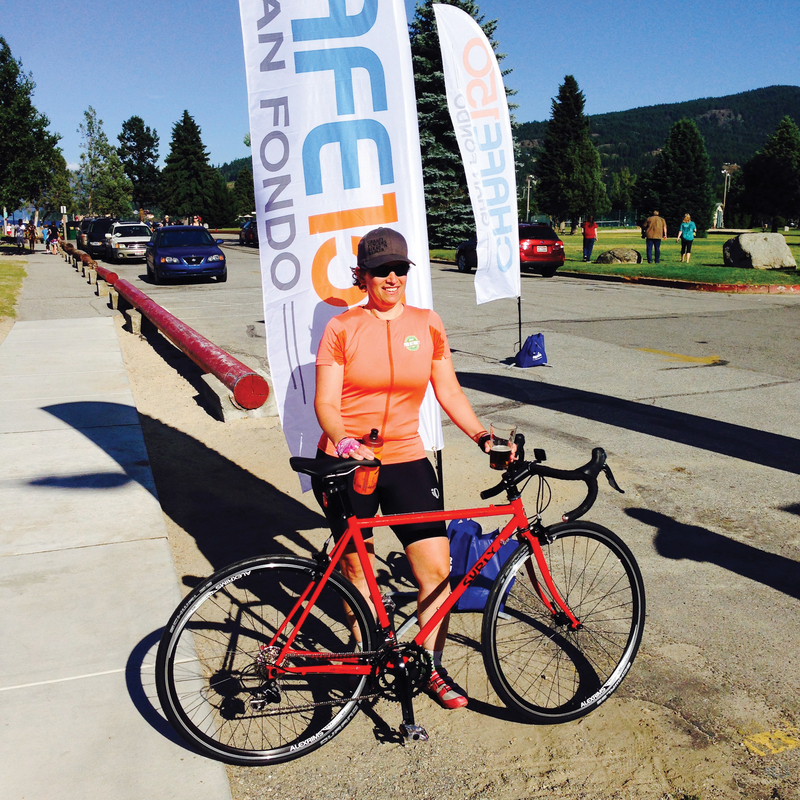 The past two years, Reich has set fundraising records for the annual CHAFE 150 Gran Fondo bicycle ride, sponsored by Sandpoint Rotary. As incentives for riders to individually raise money, Sandpoint Rotary offers prizes like special jerseys, tech gadgets and, as a top fundraiser prize, a Surly Pacer bicycle donated at cost by Greasy Fingers Bikes n’ Repair. Vicki Reich, shortly after completing her 150-mile ride. Photo by Jon Hagadone. To win the bicycle, riders have to raise at least $4,000 for CHAFE 150. Before Reich came along, nobody had raised enough to win the grand prize. Then Reich won it two years in a row. Reich hit the ground running, setting up her fundraising page, sending out emails to her mailing list and hanging fliers at her husband Jon Hagadone’s beer store, Idaho Pour Authority. She was able to surpass the fundraising mark, gathering over $4,600 the first year. She then raffled the bike off for another $2,300 and donated the proceeds to the school gardens program. Reich has been involved in the natural food industry for 25 years, so naturally her choice for the recipient involved spreading the message of health. Southside School was able to start a school garden program thanks to Reich’s donations. “I think kids learning about good nutritious food early on is so important,” she said. After the first 150-mile ride, as she sat bathing her sore legs in ice, Reich vowed to her husband Jon that she would never do it again. The two joined forces in fundraising and broke the $4,000 goal again, winning yet another bike for their efforts. “We were then able to raffle the bike off for $6,000, which we then donated to Food For Our Children,” she said. Reich, who rides 8.5 miles into Sandpoint on a daily basis, laments that she was unable to train as much for this year’s ride: “My life is a little crazy this year, what with taking a new job and all I didn’t have as much time to train,” she said. Reich said her and Jon plan to ride the CHAFE 30 this year as a “hiatus” then return to the 150 next year, where she hopes to shatter fundraising efforts yet again, both for Sandpoint Rotary, as well as the charity of her choosing when she raffles off the bike. The CHAFE 150, sponsored by Sandpoint Rotary, takes place on June 17, 2017. To learn more about the bike ride, go to www.chafe150.org.